08-Jul-2018: Mahendra Singh Dhoni became the first wicket-keeper to take 50 catches in T20Is and also the first wicket-keeper to take five catches in one innings. 03-Sep-2017: MS Dhoni becomes first wicketkeeper to register 100 ODI stumpings. 30-Jun-2017: MS Dhoni becomes the first Indian batsman to hit 200 sixes in ODIs. 23-Jun-2013: He become the first captain in the history of the cricket to lift all three major ICC trophies - World Twenty20 2007, Cricket World Cup 2011 and Champions Trophy 2013. 24-Mar-2013: After 4-0 series win against Australia, Mahendra Singh Dhoni became the first Indian skipper to register a clean sweep in a series of four Tests against any side. 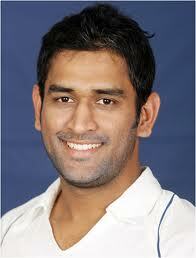 24-Mar-2013: MS Dhoni became the first skipper to post eight consecutive Test wins against Australia on Indian soil. 05-Mar-2013: With the second Test win against Australia in Hyderabad, he became the most successful Indian captain, eclipsing Sourav Ganguly's record of 21 Test wins. 25-Feb-2013: MS Dhoni's 224-run knock against Australia in the first Test is the highest score by an Indian captain in Test cricket and the third highest at Chepauk. He breaks Sachin Tendulkar (217) record as captain. India captain Dhoni is the second captain in the 132-year history of Test cricket who has not lost a Test match in his first 11 games. 31-Oct-2005: His (183*) against Sri Lanka is highest individual total by any wicket-keeper in ODI. He captained the Indian cricket team in the 2007 ICC Twenty20 World Cup, which India won..
Mahendra Singh Dhoni's losing the toss in third ODI of the tri-series between India and Sri Lanka is his tenth consecutive loss. 24-March-2011: India's World Cup quarterfinal match against Australia was the 100th ODI as skipper for MS Dhoni. He is the first wicketkeeper captain to achieve this landmark.